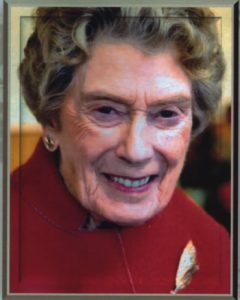 Tris died aged 97 on 12th January 2018. She will be particularly remembered by our readers as Business Manager for the Marist Messenger. Tris fulfilled this role for 15 years. The latest copy of the magazine was in her room when she died. Tris voluntarily commenced work with the Marist Messenger in 1982. She sorted the membership record cards and in 1984 took on the daunting task of learning a computer system and loading the readership list onto the computer. Having thus organised the records, she was then able to print out monthly accounts and labels and run the weekly banking. Over the coming years, Tris contributed to the Marist Messenger in many ways which included input into design and emergency proof-reading. She had the ability, as well as the forthrightness, to state if she thought particular articles did not have a place in the magazine. She also represented the Marist Messenger at the annual Conferences of the Australasian Religious Press and Australasian Catholic Press held in Sydney. Tris remained with the Marist Messenger until August 1997 when she retired. Geoff Officer, one of Tris’ three sons, outlined her wider life in his eulogy. A trained physiotherapist, she founded a kindergarten in Plimmerton, when she was first married. Then ten happy years (1959 – 1969) in Fiji saw her work as the Librarian for the Agricultural Department, and as National Secretary and then national President of the Fiji Red Cross. 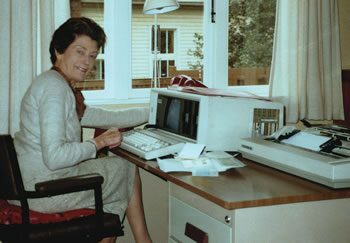 Returning to New Zealand in 1970, she took on the role of International Secretary for the Catholic Women’s League, then moved on to National Secretary for the League. After some years in this role she became National Secretary of Pregnancy Help (NZ) and then served as its second National President. Throughout her life, wherever she was living, she took a keen interest in Church affairs and its teaching. A University Gold Medalist, she had a keen intellect. Her early days before her marriage saw her part of a social justice movement that espoused the encyclical, “Rerum Novarum”, the great encyclical on the Church’s social teaching. She read, she prayed and worshipped her God, and she made her home one of hospitality and welcome to the clergy and religious of the various parishes to which she belonged. In his homily, Fr Michael McCabe reflected on the significance of Tris’s name, Beatrice. Beatrice is the ideal woman in Dante’s Divine Comedy. She guides Dante in the soul’s journey into God. Beatrice leads Dante through the nine celestial spheres of heaven, through the virtues to the heart of God, a journey achieved through the fire of refining love and the deep suffering of the spirit. In the Gospel for the Requiem Mass (John 14:1-6), Thomas struggles to understand where Jesus is going. Tris echoed that search in the seeming silence of God at the end of life. Like Thomas she met the risen Lord in the community of disciples and in her Faith. bigger kids realise, she’s one of a kind. being born in her era, a cruel little trick. gave life her full value. gave her service, they will tell you. never taking more than she needs, charitable service, a living angel indeed. The Marist Messenger and the Society of Mary are grateful for this special person whose life was closely woven with ours. Our sympathy to her sons, Geoff, Chris and David and their partners and extended families. May Tris enjoy eternal life.